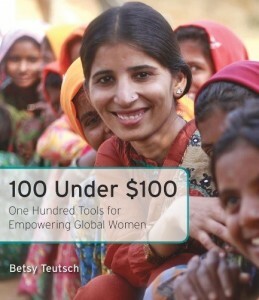 100 Under $100, is an inspiring book, written by Betsy Teutsch. It explains, in easily understood prose, the challenges faced by the world’s billion+ most impoverished women. These women work incredibly hard, held back by a dearth of resources and education, little access to health care, and discriminatory legal and financial services. With better tools and expanded access, women’s hard work will be more productive, yielding better outcomes for them, their families and their communities. The highlighted tools will provide women a toe-hold to climb the ladder out of extreme poverty. You can order this book at Amazon online.